Winter solstice is a special time of year when we gather together with people dear to us. In pagan tradition this event is called "Yule". I thought it is a good time to write a progress report and a summary of changes made since the last release. I apologise for infrequent updates. On the other hand we are busy with improving McCLIM and many important (and exciting!) improvements have been made in the meantime. I'd love to declare it a new release with a code name "Yule" but we still have some regressions to fix and pending improvements to apply. We hope though that the release 0.9.8 will happen soon. We are very excited that we have managed to resurrect interest in McCLIM among Common Lisp developers and it is thanks to the help of you all - every contributor to the project. Some of you provide important improvement suggestions, issue reports and regression tests on our tracker. Others develop applications with McCLIM and that helps us to identify parts which need improving. By creating pull requests you go out of your comfort zone to help improve the project and by doing a peer review you prevent serious regressions and make code better than it would be without that. Perpetual testing and frequent discussions on #clim help to keep the project in shape. Financial supporters allow us to create bounties and attract by that new contributors. Speaking of finances: our fundraiser receives a steady stream of funds of approximately $300/month. We are grateful for that. Right now all money is destined for bounties. A few times bounty was not claimed by bounty hunters who solved the issue – in that case I've collected them and re-added to funds after talking with said people. Currently our funds available for future activities are $3,785 and active bounties on issues waiting to be solved are $2,850 (split between 7 issues). We've already paid $2,450 total for solved issues. [$600] drawing-tests: improve and refactor (new!). [$600] streams: make SEOS access thread-safe (new!). [$450] clx: input: english layout. [$300] listener: repl blocks when long process runs. [$150] UPDATING-OUTPUT not usable with custom gadgets. [$100] No applicable method for REGION-CONTAINS-POSITION-P -- fixed by Cyrus Harmon and re-added to the pool. [$200] Text rotation is not supported -- fixed by Daniel Kochmański. [$400] Fix Beagle backend -- cancelled and re-added to the pool. [$100] with-room-for-graphics does not obey height for graphics not starting at 0,0 -- fixed by Nisar Ahmad. [$100] Enter doesn't cause input acceptance in the Listener if you hit Alt first -- fixed by Charles Zhang. [$100] Listener commands with "list" arguments, such as Run, cannot be executed from command history -- fixed by Nisar Ahmad. [$200] add PDF file generation (PDF backend) -- fixed by Cyrus Harmon; This bounty will be re-added to the pool when the other backer Ingo Marks accepts the solution. I'm sure you've been waiting for this part the most. Current mid-release improvements and regressions are vast. I'll list only changes which I find the most highlight-able but there are more and most of them are very useful! The whole list of commits and contributors may be found in the git log. There were also many changes not listed here related to the CLX library. Listener UX improvements by Nisar Ahmad. Mirrored sheet implementation refactor by Daniel Kochmański. This part is a joint effort of many people. 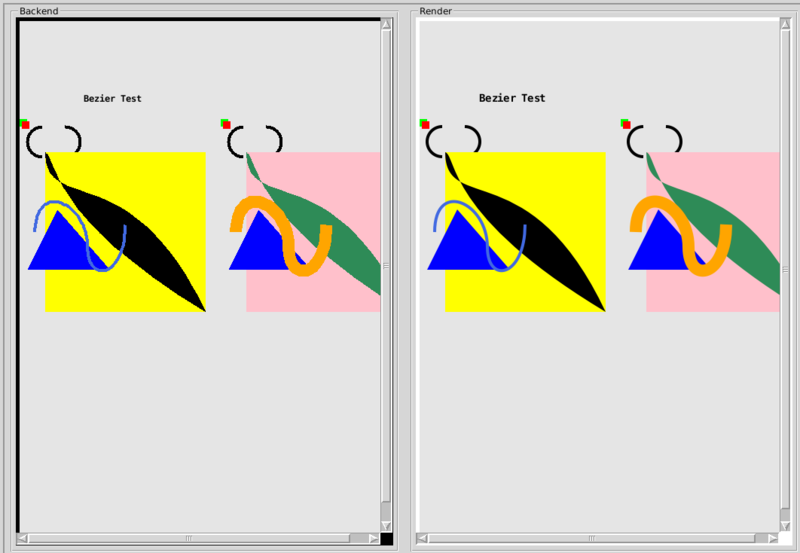 In effect we have now two quite performant and good looking font rendered. Elias Mårtenson resurrected FFI Freetype alternative text renderer which uses Harfbuzz and fontconfig found in the foreign world. Daniel Kochmański inspired by Freetype features implemented kerning, tracking, multi-line rendering and arbitrary text transformations for the native TTF renderer. That resulted in a major refactor of font rendering abstraction. 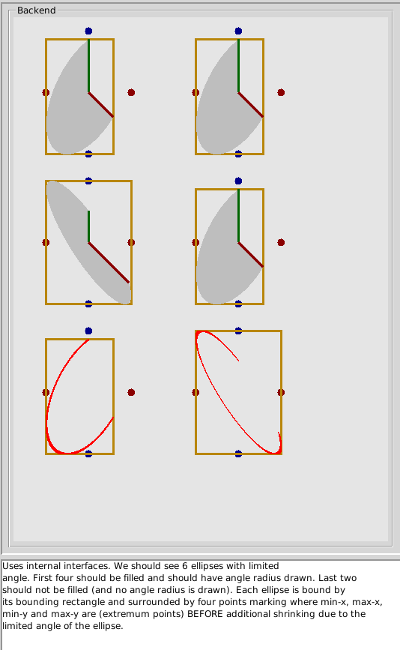 Missing features in the TTF renderer are font shaping and bidirectional text. 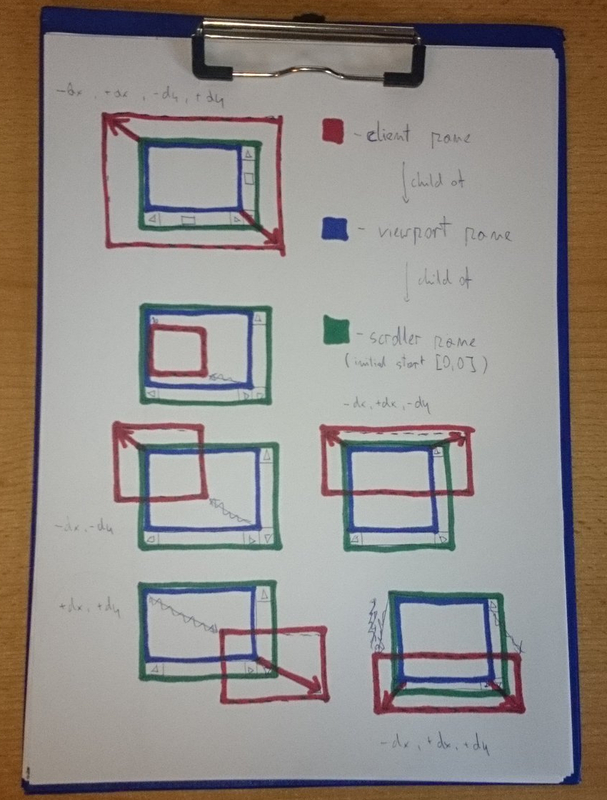 Image and pattern rendering refactor and improvements by Daniel Kochmański. Both experiments with xrender and pattern rendering were direct inspiration for work-in-progress migration to use xrender as default rendering mechanism. Patterns have now much better support coverage than they used to have. We may treat pattern as any other design. Moreover it is possible to transform patterns in arbitrary ways (and use other patterns as inks inside parent ones). This has been done at expense of a performance regression which we plan to address before the release. Most of the work was related to simplifying macrology and class hierarchy. This caused small performance regression in this backend (however it may be fixed with the current abstraction present there). Jan wrote a very useful tool called clim-flamegraph (it works right now only on SBCL). It helped us to recognize many performance bottlenecks which would be hard to spot otherwise. His contributions to the code base were small (LOC-wise) and hard to pin-point to a specific feature but very important from the maintanance, correctness and performance point of view. clim-extensions:box-adjuster-gadget deserves a separate mention due to its usefulness and relatively small mind share. It allows resizing adjacent panes by dragging a boundary between them. 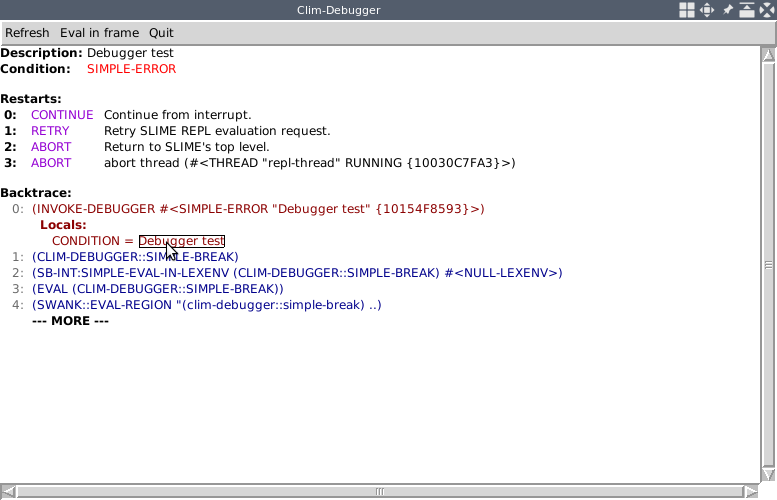 This solves a long standing regression – McCLIM didn't run correctly on implementations without support for threading. This rewrite cleaned up a few input processing abstractions and provided thread-safe code. SCHEDULE-EVENT (which was bitrotten) works as expected now. This role is easy to omit when one looks at commits but it is hard to overemphasize it – that's how important testing is. Code would be much worse if Nisar didn't put as much effort on it as he did. Before the next release we want to refactor input processing in McCLIM and make all stream operations thread-safe. Refactoring input processing loop will allow better support for native McCLIM gadgets and streams (right now they do not work well together) and make the model much more intuitive for new developers. We hope to get rid of various kludges thanks to that as well. Thread-safe stream operations on the other hand are important if we want to access CLIM application from REPL in other process than the application frame (right now drawing from another process may for instance cause output recording corruption). This is important for interactive development from Emacs. When both tasks are finished we are going to release the 0.9.8 version. After that our efforts will focus on improving X11 backend support. Most notably we want to increase use of the xrender extension of clx and address a long standing issue with non-english layouts. When both tasks are accomplished (some other features may land in but these two will be my main focus) we will release 0.9.9 version. That will mark a special time in McCLIM development. Next release will be 1.0.0 what is a significant number. The idea is to devote this time explicitly for testing, cleanup and documentation with a feature freeze (i.e no new functionality will be added). What comes after that nobody knows. Animations? New backends? Interactive documentation? If you have some specific vision in which direction McCLIM should move all you have to do is to take action and implement the necessary changes :-). This year was very fruitful for McCLIM development. We'd like to thank all contributors once more and we wish you all (and ourselves) that the next year will be at least as good as this one, a lot of joy, creativeness and Happy Hacking! CLIM operates on various kinds of objects. Some are connected by an inheritance, other by a composition and some are similar in a different sense. As programmers, we often deal with the inheritance and the composition, especially since OOP is a dominating paradigm of programming (no matter if the central concept is the object or the function). Not so often we deal with the third type of connection, that is the Form and the phenomena which are merely a shadow mimicking it. Let us talk about sheets. The sheet is a region with an infinite resolution and potentially infinite extent on which we can draw. Sheets may be arranged into hierarchies creating a windowing system with a child-parent relation. Sheet is the Form with no visual appearance. What we observe is an approximation of the sheet which may be hard to recognize when compared to other approximations. : And many other things. Sheet hierarchies may be manipulated without a physical medium but to make them visible we need to draw them. 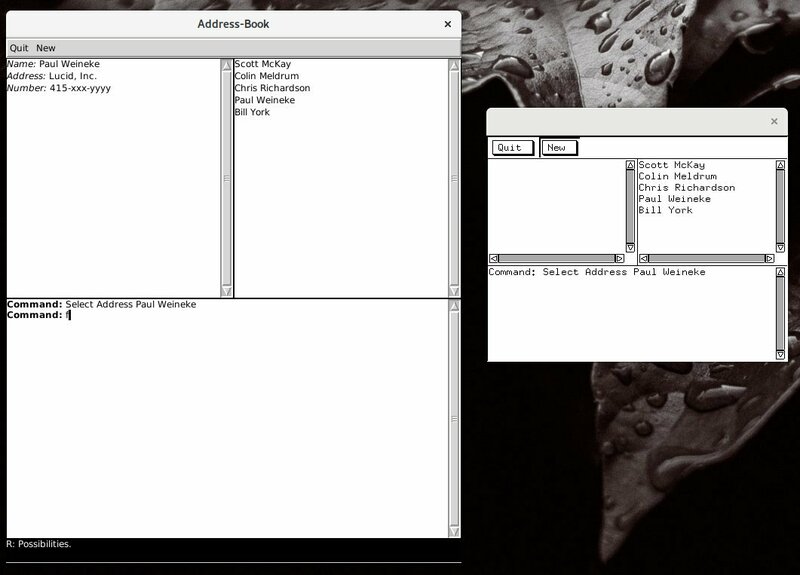 CLIM defines ports and grafts to allow rooting sheets to a display server. 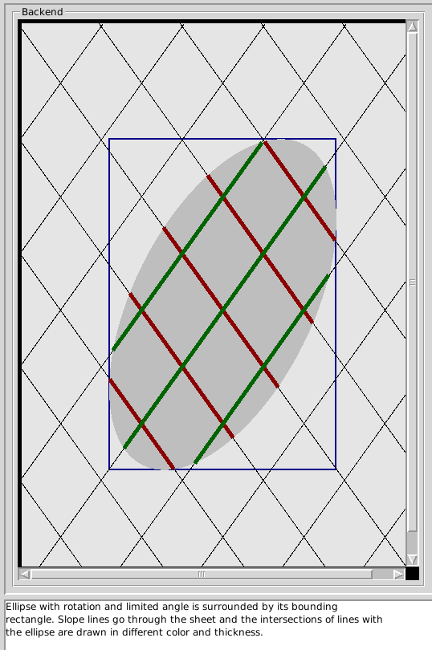 medium is defined to draw sheet approximation on the screen. If we assume device-specific unit results may drastically differ (density may vary from say 1200dpi on a printer down to 160dpi on a desktop!. 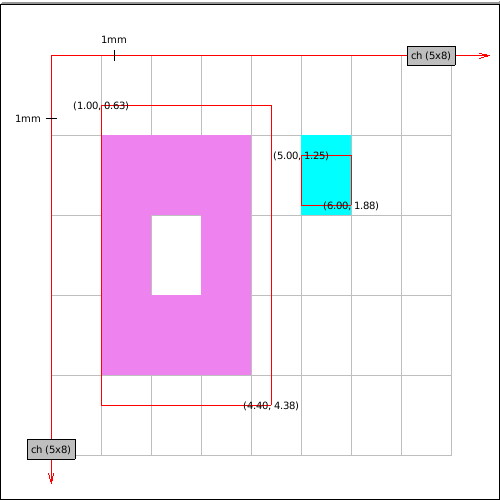 The very same square could have 1cm on a paper sheet, 7cm and 10cm on different displays and 200cm on a terminal. From the perspective of a person who uses the application, this may be confusing because physical objects don't change size without a reason. Another possible approach is to assume the physical world distances measured in millimeters (or inches if you must). Thanks to that object will have a similar size on different mediums. This is better but still not good. We have to acknowledge that most computer displays are pixel based. Specifying distances in millimeters will inevitably lead to worse drawing quality (compared to the situation when we use pixels as the base unit). Moreover, conversion from millimeter values to the pixel will most inevitably lead to work on floats. Some applications may have specific demands. 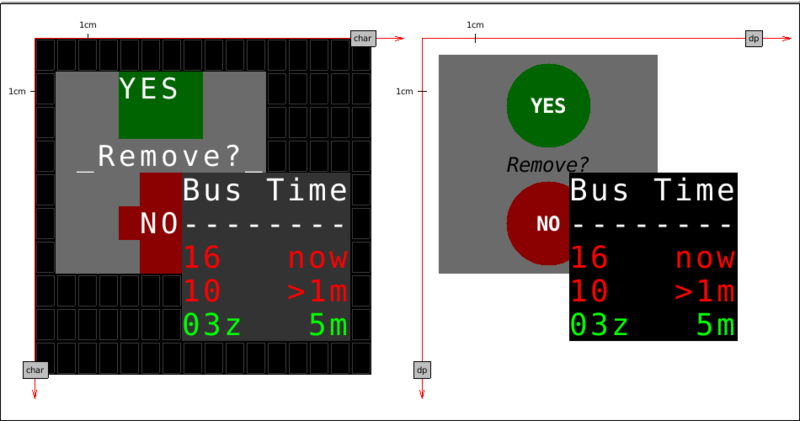 For instance, application is meant to run on a bus stop showing arrival times. Space of the display is very limited and we can't afford approximation from the high-density specification (in pixels or millimeters) to 80x40 screen (5 lines of 8 characters with 5x8 dots each). 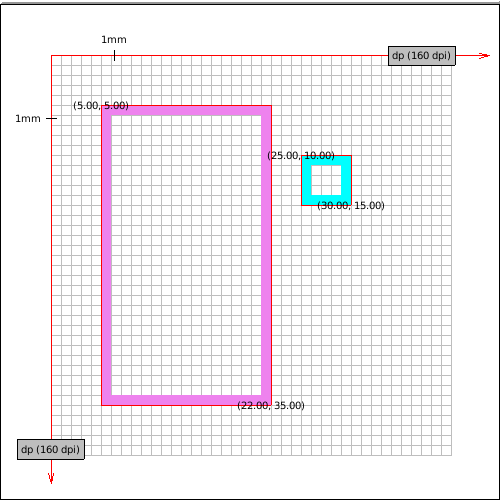 We need to be very precise and the ability to request a particular unit size for a sheet is essential. Of course, we want to test such application on a computer screen. I will try to answer this question in a moment. First, we have to talk about the CLIM specification and limitations imposed by McCLIM's implementation of grafts. : See some general recommendations. : Technically it should be PPI, not DPI (pixels per inch). : Given programmer specifies sheet size in integers (like 100x100). If a port is a physical connection to a display server then graft is its screen representation. The following picture illustrates how the same physical screen may be perceived depending on its settings and the way we look at it. As we can see graft has an orientation (:default starts at the top-left corner like a paper sheet and :graphics should start at the bottom left corner like on the chart). Moreover, it has units. Currently, McCLIM will recognize :device, :inches, :millimeters and :screen-sized . That said McCLIM doesn't implement graft in a useful way. Everything is measured in pixels (which :device units are assumed to be) and only the :default orientation is implemented. By now we should already know that pixels are a not a good choice for the default unit. Also, programmer doesn't have means to request unit for a sheet (this is the API problem). 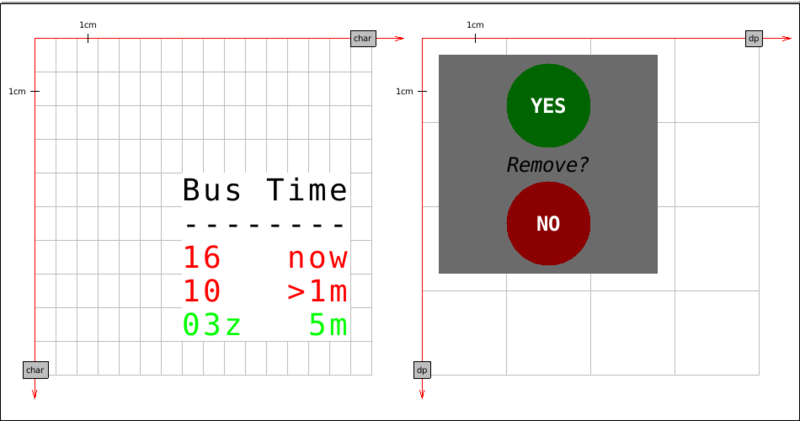 : Screen size unit means that the coordinate [1/2, 1/2] is exactly in the middle of the screens. We will skip the third situation, for now, to decide what unit should we default to. There are cognitive arguments for units based on a real-world distance but there are also and practical reasons against using millimeters – poor mapping to pixels and the fact that CLIM software which is already written is defined with the assumption that we operate on something comparable to a pixel. Having all that in mind the default unit should be device-independent pixel. One of McCLIM long-term goals is to adhere to Material Design guidelines – that's why we will use dip unit. 100dp has absolute value 15.875mm. On 160dpi display it is 100px, on 96dpi display it is 60px, on 240dpi display it is 150px etc. This unit gives us some nice characteristics: we are rather compatible with the existing applications and we preserving absolute distances across different screens. Application medium may be a pixel-based screen, paper sheet or even a text terminal. When the programmer writes the application he operates on dip units which have absolute value 0.15875mm. It is the McCLIM responsibility to map these units onto the device. To be precise each graft needs to hold an extra transformation which is applied before sending content to the display server. 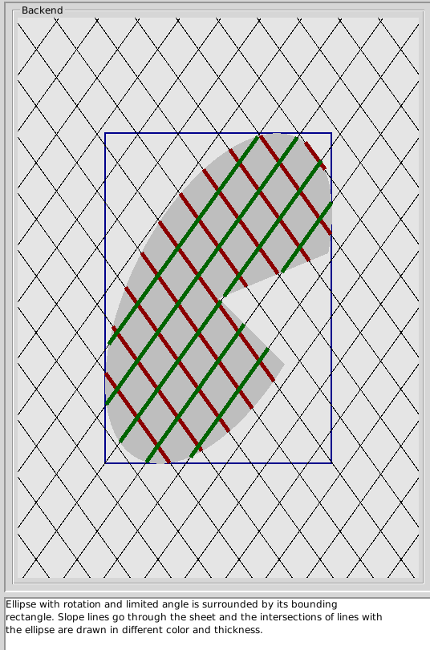 Now we will go through a few example mappings of two rectangle borders drawn on a sheet. The violet rectangle coordinates are [5,5], [22,35] and the cyan rectangle coordinates are [25,10], [30,15]. MDPI display device units are dip and they match native units of our choosing. No transformation is required. Some old displays have density 72PPI. Not all coordinates map exactly to pixels - we need to round them. Notice that border is thicker and that proportions are a little distorted. On the other hand despite a big change in resolution size of the object is similar in real-world values. Windows Presentation Foundation declared 96PPI screen's pixel being the device-independent pixel because such displays were pretty common on desktops. Almost all coordinates map perfectly on this screen. Notice the approximation of the right side of the violet rectangle. Fact that the screen has higher density doesn't mean that coordinates mapping perfectly on a lower density screen will map well to a higher density one. Take this HDPI screen. Almost all coordinates are floats while on the MDPI display they had all integer values. Some printers have a really high DPI, here is imaginary 2560 DPI printer. Funnily enough its accuracy exceeds our screen density so the red border which is meant to show the "ideal" rectangle is a little off (it's fine if we scale the image though). Until now we've seen some screens with square pixels (or dots). Let's take a look at something with a really low density - a character terminal. To make the illustration better we assume an absurd terminal which has 5x8 DP per character (too small to be seen by a human eye). 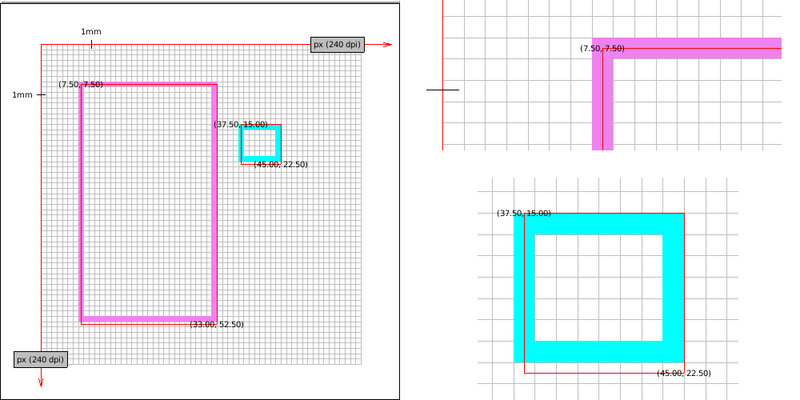 Notice that the real size of the rectangles is still similar. It is time to deal with graphics orientation (Y-axis grows towards the top). An imaginary plotter with 80DPI resolution will be used to illustrate two solutions (the first one is wrong!). Knowing the plotter screen height is important to know where we start the drawing. Graft reverts Y axis and sends the image to the plotter. Do you see what is wrong with this picture? We have defined both rectangles in default orientation, so our drawing should look similar disregarding the medium we print on. 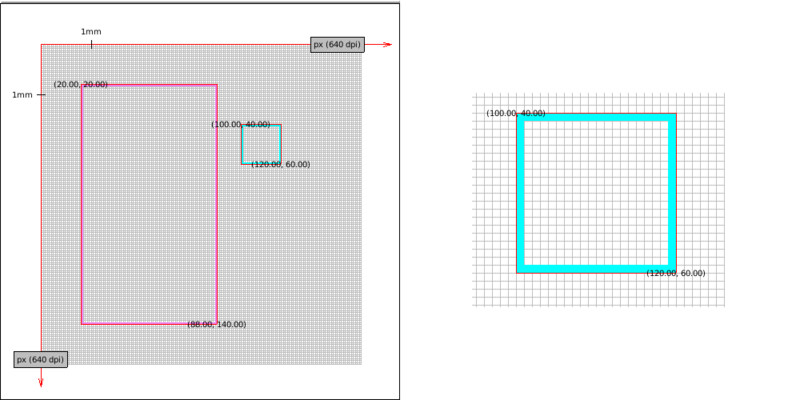 We do preserve the real size but we don't preserve the image orientation – cyan rectangle should be higher on the plot. 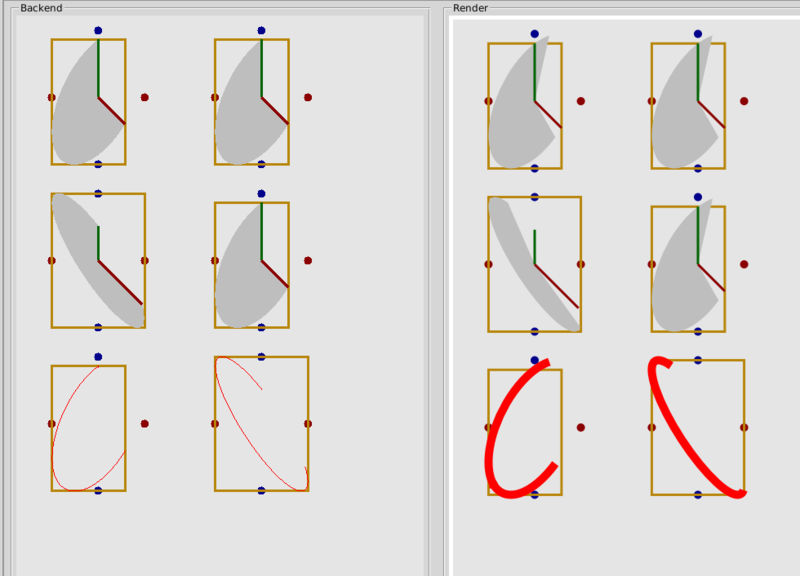 Correct transformation involves reverting Y axis and translating objects by the screen height. See the correct transformation (on 80DPI and on MDPI plotter). : the Ideal border is composed of lines which are 1-dimensional objects which doesn't occupy any space. Red border in drawings marks "ideal" object boundaries. Points are labeled in device units (with possible fractions). There is still an unanswered question - how can we program applications with a specific device limitations in mind? As we have discussed earlier default sheet unit should be dip and default sheet orientation is the same as a paper sheet's. Writing an application for a terminal is different than writing an application for a web browser. The number of characters which fit on the screen is limited, drawing shapes is not practical etc. To ensure that the application is rendered correctly we need a special kind of sheet which will operate on units being characters. Take a look at the following example. The first sheet base unit is a character of a certain physical size. We print some information on it in various colors. Nothing prevents us from drawing a circle but that would miss the point. We use a character as a unit because we don't want rounding and approximation. 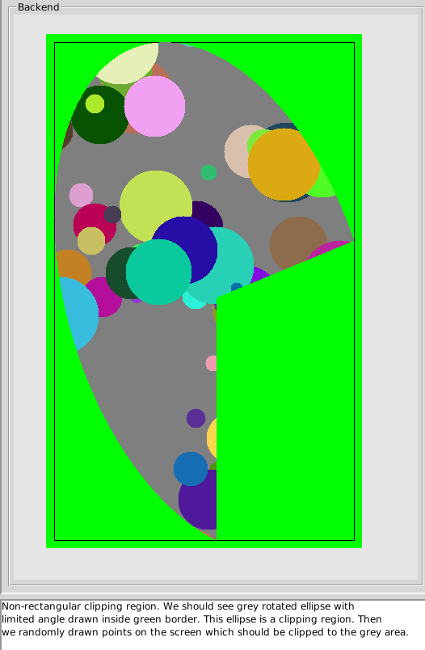 Background and foreground colors are inherited. The second sheet base unit is dip. It has two circles, solid grey background and a few strings (one is written in italic). Ideally, we want to be able to render both sheets on the same physical screen. The graft and the medium will take care of the sheet approximation. The effect should look something like this. The first screen is a terminal. Circles from the second sheet are approximated with characters and look ugly but the overall effect resembles the original application. Proportions are preserved (to some degree). We see also the terminal-specialized sheet which looks exactly as we have defined it. The second screen is mDPI display. The second sheet looks very much like something we have defined. What is more interesting though is our first sheet – it looks exactly the same as on the terminal. : Providing means to change defaults requires additional thought and is a material for a separate chapter. McCLIM doesn't allow it yet. : As we have noted sheets are ideal planar spaces where line thickness is 0 and there is nothing preventing us from using fractions as coordinates. Port is a logical connection to a display server. For instance, it may contain a foreign handler which is passed to the external system API. It is responsible for the communication – configuring, writing to and reading from a device, we are connected to. 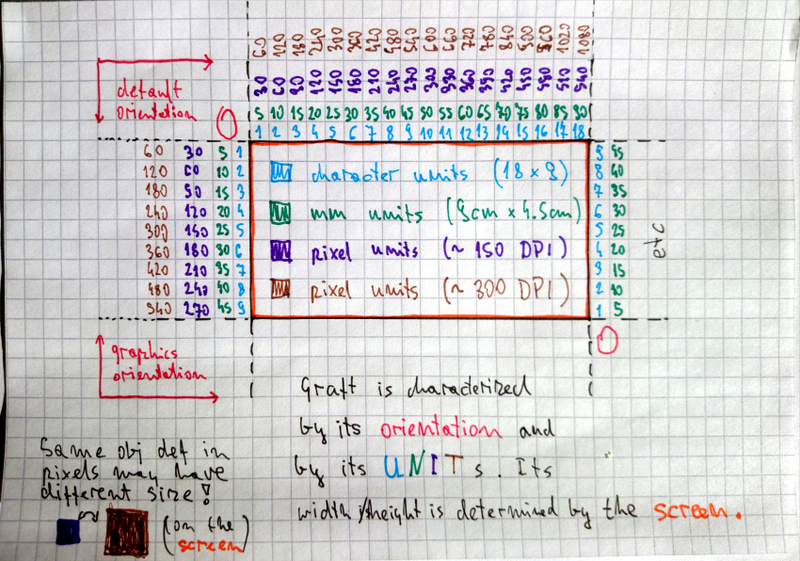 Graft is a logical screen representation on which we draw. It is responsible for all transformations necessary to achieve the desired effect on the physical screen. The same port may have many associated grafts for applications with different units and orientations. Medium is a representation of the sheet on a physical device. Sheet is the Form which is a region and may be drawn – it doesn't concern itself with physical limitations. 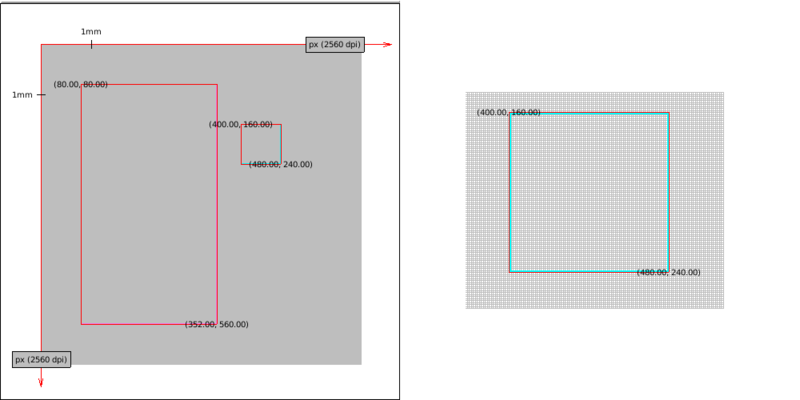 In the next post I will show how to implement the port and the graft (and a bit of the medium) for the charming backend. I will cover only bare minimum for mediums important to verify that graft works as expected. Complete medium implementation is the material for a separate post. : Sometimes we deal with devices which we can't take input from – for instance a printer, a PDF render or a display without other peripherals. After three months of work, we are happy to present this progress report. drawing tests cleanups, improvements, and additions. Some work has been done to improve CLX library. We have added a test suite and fixed its working on CCL (which had some problems with it). Thanks to that McCLIM works on CCL way faster than before (around 3x – subjective). We were also able to make CLIM-TOS (Franz's CLIM 2 fork) start simple applications on CCL and SBCL. I'm mentioning this because some people are not fond of McCLIM license and fact that we have two FOSS implementations of the same standard may be yet another good reason to start writing applications in CLIM. All McCLIM bounties (both active and already solved) may be found here. Default bounty expiration date is 6 months after publishing it (a bounty may be reissued after that time period). Our current financial status is $2014 for bounties and $288 recurring monthly contributions from the supporters (thank you!). During this quarter we have noticed more interest in learning CLIM and developing applications with it among fellow Common Lisp programmers. If you have any questions, doubts or suggestions – please contact me either by email (daniel@turtleware.eu) or on IRC (my nick is jackdaniel). McCLIM developers and users hang out on #clim IRC channel on Freenode. We have many important improvements since the last iteration and even more work is pending. I want to apologise for this late progress report – it has been almost three months since the last update. I'll try to improve in this regard. We want to thank everybody who has contributed to the project (by improving the code base, discussions, issue reporting, providing advice and suggestions, monetary contributions etc). We are especially grateful to the following people: Nisar Ahmad, Alastair Bridgewater, John Carroll, Cyrus Harmon, Philipp Marek, Elias Mårtenson, Piotr Mieszkowski, Jan Moringen, Nick Patrick, Alessandro Serra and last but not least Robert Strandh. Our current financial status is $1089 for bounties and $264 recurring monthly contributions from the supporters (thank you!). I have been asked a question about who decides which issues have bounties on them and how the reward amounts are decided. If anyone has been wondering about the same here goes the answer: issues and prices are based on my subjective opinion indicated by problems users encounter and what I consider being worth putting bounty on it. Note though, that I'm open to suggestions (see the next paragraph). I hope that despite some potential doubts the community is generally satisfied with the progress and decisions we make. If there is some lack of transparency, please let me know what you want to know and I'll do my best to help. During this iteration we had many valuable contributions. It's a joy to see how McCLIM gains more mindshare and people are willing to put their time and wallet in fixing issues and writing applications in McCLIM. cleanup of the issues (closed the obsolete and fixed ones). All McCLIM bounties (both active and already solved) may be found here. Fixed by Gabriel Laddel. Waiting for a pull request and a bounty claim. [$200] Problem with coordinate swizzling (probably). Fixed by Alessandro Serra and merged. Waiting for a bounty claim. [$100] menu for input-prompt in lisp-listener does not disappear after use. [$150] clx: input: english layout. (someone already works on it). Our current financial status is $1,429 for bounties and $267 recurring monthly contributions from the supporters (thanks! ).